When harem pants first came back onto the scene I wasn’t quite sure what to think of them. Then over the summer I saw a co-worker wear them so chicly that my interest piqued and I became inspired to dabble in the trend. She wore black harem pants with a loose-fitting green top, obviously tucked in, flats and a high bun. A few months ago I came across a pair of harem pants at Urban Outfitters and they just happened to fit perfectly. I think that unquestionably the key to wearing harem pants is that they must fit perfectly. This trend is not one of those where you can get away with trying it out just for fun even if it doesn’t look perfect. Also, I think that black is the safest way to start with this trend, simply because they won’t stand out quite as much and because black is slimming and harem pants aren’t always known for their slimming factor. 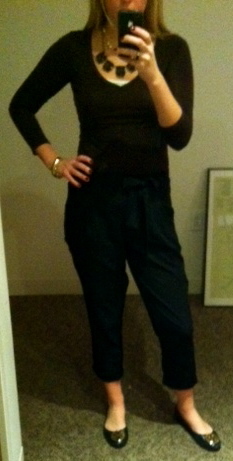 Pants: Black Urban Outfitters harem pants (with tie belt). Top: Brown J.Crew v-neck tissue tee. Necklaces: J.Crew ‘Majesty’ necklace and J.Crew pearl and gold chain necklace (doubled). Shoes: Tory Burch black leather flats with gold. Ring: David Yurman black onyx. I found that I can’t pull off the harem pants with a loose fitting top because its simply too unflattering. However, I love them with a tight fitting top and actually find them to be flattering, as they give my body an hourglass shape. I haven’t tried the pants with heels yet, but I think they look great with flats. Overall, I’m satisfied with my purchase because the pants are a trendy twist on the traditional black dress pant. They can be worn for dressier situations, but keep the look young, trendy and chic. Have you experimented with harem pants? How do you wear them?